Brian O’Sullivan will be assisted by former player David Breen, who has been named first-team coach. 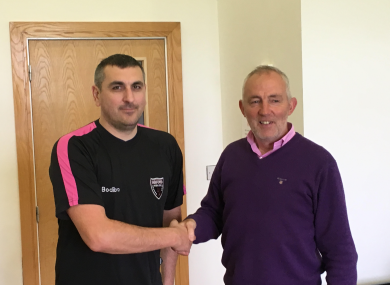 New Wexford FC manager Brian O'Sullivan (left) pictured with chairman Sean O'Shea. WEXFORD FOOTBALL CLUB have today announced the appointment of Brian O’Sullivan as their new manager for 2019. O’Sullivan takes the reins at Ferrycarrig Park after the position was vacated following the departure of Damian Locke earlier this year. Wexford’s new boss has previously worked as a coach and manager for the likes of Tramore AFC, Malahide United, Leixlip United and Bluebell United. The Waterford native will be aiming to steer Wexford to an improved campaign in 2019 after they finishing second from bottom in the First Division this season. O’Sullivan will be assisted by League of Ireland stalwart David Breen. The former Wexford defender has been installed as the club’s new first-team coach. “I am delighted to be appointed as the new manager of Wexford FC. Over time I hope I can pay the club back for showing faith in me,” O’Sullivan said. “I can’t wait to get going and meet everyone. I am particularly looking forward to meeting the players. There’s no doubt David Breen and myself can work well together and bring this club forward and become more competitive on the pitch. Email “Wexford appoint new manager following difficult 2018 campaign”. Feedback on “Wexford appoint new manager following difficult 2018 campaign”.